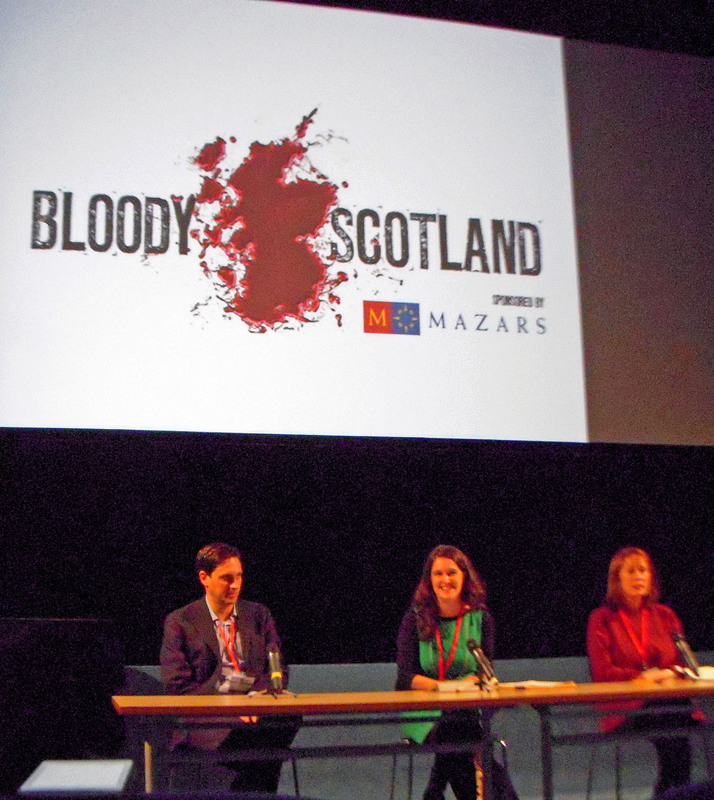 One of the perks of this year’s Bloody Scotland International Crime Writing Festival in Stirling was the opportunity to hear the best of the field offer advice to hopeful writers on the process of writing, publishing and whatever comes in between. The Agents’ and Publishers’ panel was lead by Claire Squires, director of Stirling Centre for International Publishing and Communication on September 13th. The panel discussed what happens after the next hopeful front list bestseller has been written and when the author seeks to have the manuscript accepted either by an agent or a publisher. Taking part in the panel were Jenny Brown, of Jenny Brown Associates, and David Shelley, of Little Brown. Jenny is equally inspiring and intimidating for an aspiring literary agent such as myself, having opened her agency in 2002 after years of formidable experience, not forgetting being the founder of the Edinburgh International Book Festival. If that’s not enough, she and her associates have become the biggest literary agent in Scotland and one of the leading agencies in UK, with international reputation. David on the other hand represents the other hurdle in the writer’s way towards bestselling stardom – the publisher. David, who has worn many a different hat under the general title publisher has not settled for one particular job title – he also guests as an editor for a few selected authors within Little Brown, including Val McDermid and Mitch Albom (and yes, JK Rowling too, but let’s focus on other exciting aspects of David’s career, shall we?). Jenny launched right into the session by emphasising how crime writing is still the fastest growing genre in the UK (and one of the leading internationally), with approximately 30% of the book market. David agreed – crime writing is definitely the most commercially growing genre that is remarkably consistent despite other market or trend fluctuations – fluctuations we know all too well that publishing is harshly dependent on. As the trend moves on, so will the publisher. Be confident, know your trade, know your next steps and especially – know whom you are talking to when making a pitch. You might think you have the voice that gives the very angels orgasms, but your agent might disagree. Let your story do the talking. All fine tips from the literary agents’ mouth. Both Jenny and David agreed that trends are nearly impossible to keep up with; what is “hot” right now could very well be over by the time you have the manuscript of a bestseller that nicely fits into that pigeonhole all finished and ready to be pitched. Trends move on faster than anyone can write, and rather than focusing on fitting into that niche, both Jenny and David emphasised, an aspiring writer would do well to focus on being passionate and finding your own voice, your niche, rather than doing lavish imitations of others’ work. Jenny also – to my great pleasure – emphasised how translated crime writing is breaking the barriers and entering the UK market. David remarked upon the cold realism of marketing; it is nearly impossible to bring out a title that is based on the same basic idea as one published before. There is no space in the market for two great Fife based detectives, but there might be space for one great detective from Fife, and the other from – why not – Stirling. How you present your setting is what makes you, as a writer, unique. Classic crime is being brought back as well as being retranslated. Foreign authors are intriguing, whereas deceased writers are proving to be some of the toughest competition to the wave of new writers. One particularly interesting piece of advice that David provided for budding writers was to imagine further than one novel. He has found himself attracted to authors who can envision at least a couple volumes of a series, can explain character traits and subplots beyond that one particular event in the novel they are currently pitching. A good series of novels with an ever-evolving character can very well be the key to cracking your way into the crime-writing scene. Claire led the discussion to the actual publishing process; what channels are there for new writers? How can one get their manuscript read, represented and subsequently published? As expected, both David and Jenny agreed on this point strongly; get an agent. It is nearly impossible to break into publishing without being professionally represented. Most publishing houses do not accept unsolicited manuscripts so agents act as a quality control filter for publishers. Jenny emphasised having manuscripts edited by a professional freelancer – never submit anything you are not absolutely sure is the best it can be. And this is doubly important for self-publishing authors. Be confident, know your trade, know your next few steps and especially – know whom you are talking to when making a pitch. Let your story do the talking. It is even more advisable to target your agent and publisher. Do your homework – know whom you are pitching to and make sure they know why you have chosen them. Or perhaps if you’re desperate and unsure of your manuscript, a box of chocolates never hurts – doesn’t necessarily help either, but definitely never hurts. Claire opened a topic that is much debated in publishing circles – self-publishing. Jenny explained how self-publishing allows more control and can lead to enticing a wide readership, which in turn encourages word-of-mouth and reviews before landing under the ears or eyes of an publisher. Self-publishing allows the writer to test the waters and to cater for the readership before attempting to break into the market. Although, writers would do well to note, that if you have already published something on the internet, the good bet is that a hopeful publisher would prefer to publish something completely new from you – or perhaps offer you a series deal. David did mention how even editors browse through self-publishing platforms – such as Authonomy – as you never know what you might find. The panel concluded with questions from the master class participants; one particularly memorable was one lady from the master class, who has a number of novels (18 to be exact) published online but no one had yet approached her nor returned her numerous attempts to contact agents and publishers. Jenny’s initial reaction was to enquire what does she believe an agent could do for her that she cannot do herself? What indeed. To leave on a hopeful note, Claire asked both David and Jenny to give the master class some final words of inspiration. David encouraged the budding writers never to give up, as the first book published is rarely the first book written, and to especially venture into other avenues than traditional forms of publishing – digital, self-publishing and the like can prove to be a writer’s saviour, enabling an initial point of contact, enticing on its own merit. Jenny emphasised the necessity of wide reading, because all that we read will feed into what we write, how we write and how we present ourselves. There is hope for everyone.